The Tesla Model 3 is supposed to make or break Tesla, and it’s supposed to go into production in just three months. But the weird thing is, no one’s seen a clean shot of a release candidate yet (save for a crappy, brief clip posted last month). Until now. 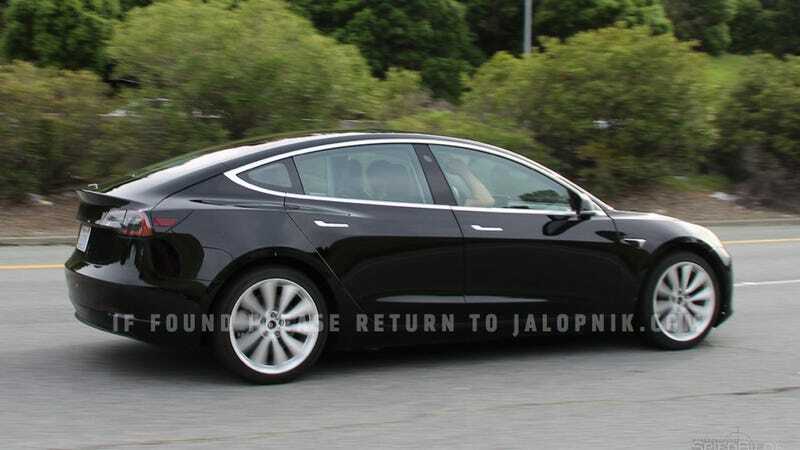 This is a prototype just spotted running around, and if Elon’s right, that means it’s damn near production-spec. One of the biggest mysteries of the Model 3 has been its interior. We were assured that the first prototypes we saw last year didn’t have the final design, and then Tesla CEO Elon Musk said that it wouldn’t have a traditional speedometer at all. It would just have a big center screen. But it wouldn’t have a heads-up display either, so how were you supposed to know how fast you were going? Now we know, I suppose. It’s a huge center screen, as promised. But unlike the earlier Tesla Model S and Tesla Model X, it’s like a big horizontal tablet stuck to the dash, rather than a vertical one integrated with the rest of the car. Elon also promised that the nose and the trunk would be tweaked as well, even soliciting help from the rabble, and we can see that there’s definitely more of a crease to it for a more “traditional” look. That sort of thing is important when you’re trying to sell millions to the masses.